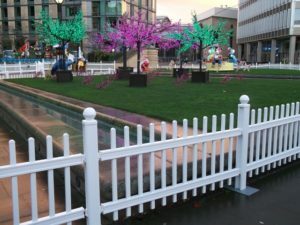 If your fencing requirement is short-term or temporary – maybe you need to fence off a queue, a Christmas tree, a music festival or a café seating area – then Liniar’s free-standing event fencing is perfect for you. These durable, lightweight, easy-to-use fencing panels are ideal for any occasion that needs a boundary creating or where a temporary free-standing fencing system is required. 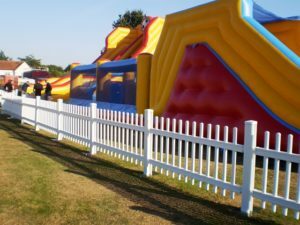 Perfect for a multitude of events, we offer a versatile range of fencing styles which can be supplied in bar lengths or in pre-fabricated panels, for permanent or temporary installation. The fencing is easy to construct, will not warp or rot and requires no maintenance other than the occasional clean. Liniar Event Fencing is made in our Derbyshire factory using lead-free window grade durable uPVC. For more information on how Liniar Event Fencing can complement your occasion or club, contact us here.